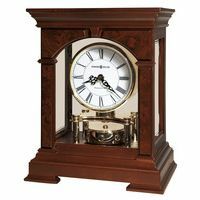 This is a huge carved case Winterhalder and Hoffmeier wall clock. 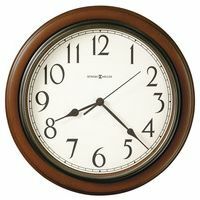 It has a double fusee movement which strikes the hour on a beautiful deep sounding gong. The movement is signed WH and Sch. (W&H), so it is an early Winterhalder and Hoffmeier. The clock dates from the late 1800's and is in good running order. The case, as you can see by the many pictures below, is impressively carved wood -- we would say most likely mahogany. It does have some older repairs as you can see. One leaf on the left side of the case has been re-glued, and on two tips of leaves, about one half inch or so on each is missing. These minor imperfections could be left alone or it could be a small repair by a knowledgeable wood worker. The case is really beautiful and huge at 44 inches tall and 21 inches wide. The 12 inch dial is in great condition with a retailers name which looks like Baringer and Bros. The dial bezel closes perfectly but the locking part behind the bezel is missing. The pendulum bob could be polished or left in its antique looking state. 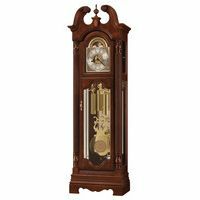 The pendulum stick top portion looks like it may not be original to the clock but is not seen when the clock is running. We rarely see a Winterhalder Hoffmeier wall clock, and this one really is an impressive looking and sounding clock.